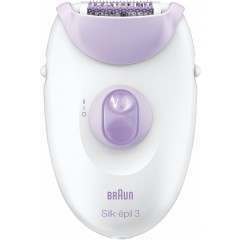 Reveal your flawless glow with the world’s first facial cleansing brush & epilator by Braun. The cleansing brush removes all impurities for a pore-deep clean like no other. 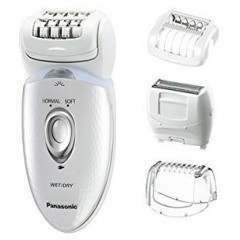 The facial epilator features a slim head for ultimate precision on the chin, upper lip, forehead and to maintain eyebrows. 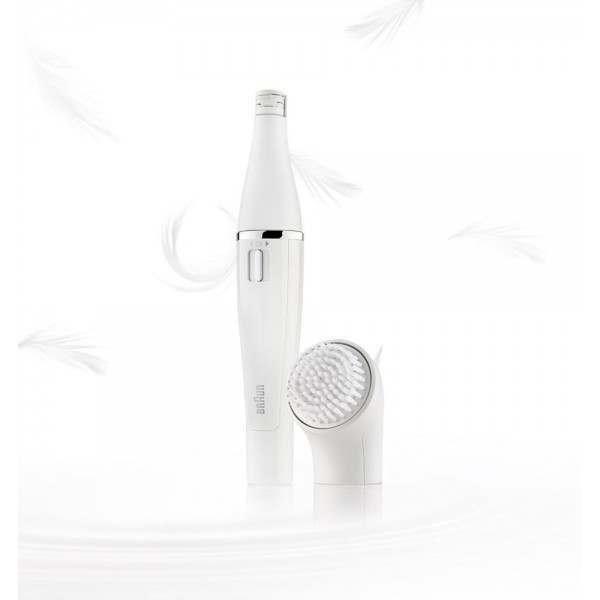 Introducing the world’s first facial cleansing brush and epilator. 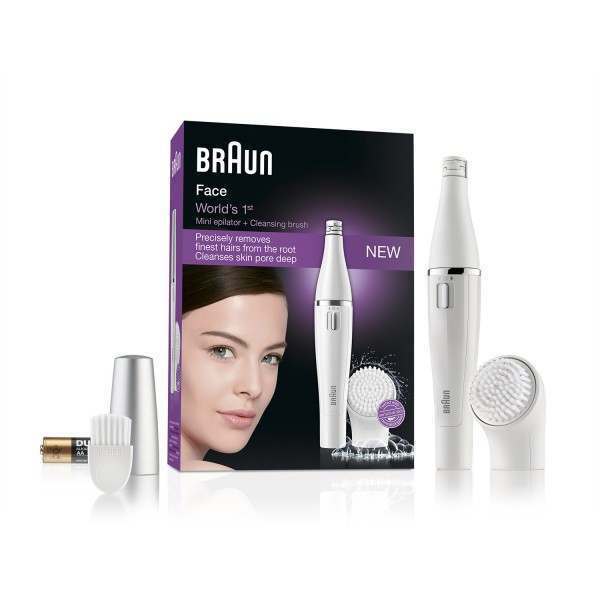 Braun Face combines two facial treatments in one battery operated device: gentle deep pore cleansing with the brush & precise epilation of the finest hairs. 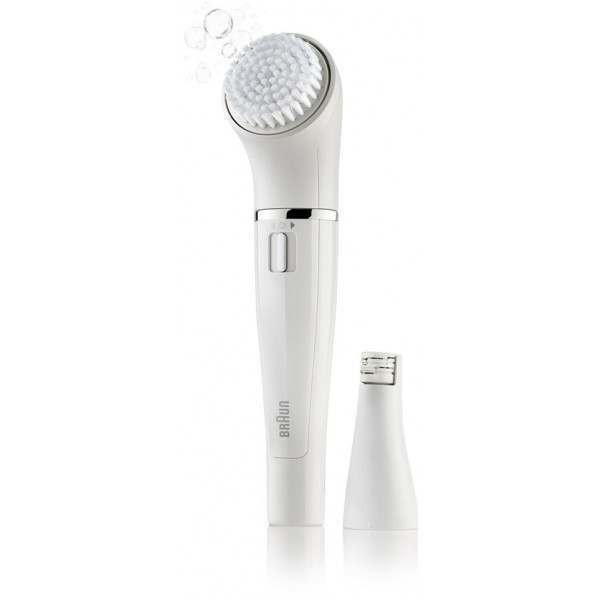 Removes make-up and impurities pore deep - The cleansing brush gently oscillates to loosen make up, oil and impurities like pollution and dust, for 6x better cleansing than manual. 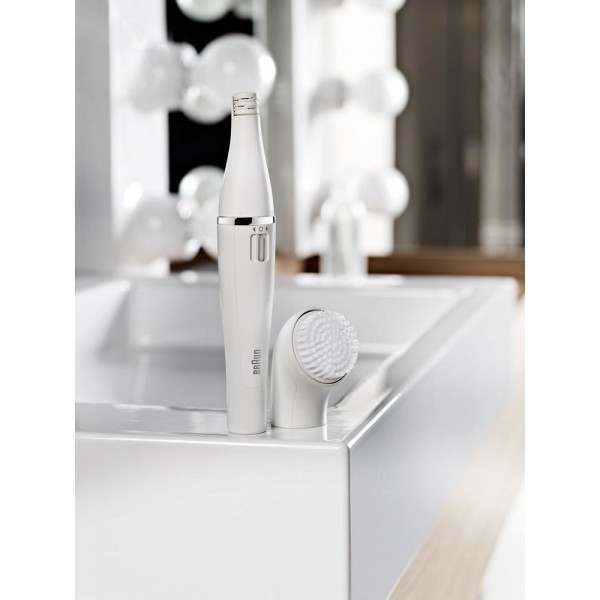 Refines and exfoliates via micro-oscillations - With hundreds of micro-oscillations per minute, the brush gently but effectively cleanses even sensitive skin. For use in your shower routine - Take your new cleansing brush under the shower, it can be used with water and your favourite cleansing gel. Brush refill - To maintain top performance and hygiene, renew the brush every 3 months with a new refill. Happy cleansing! 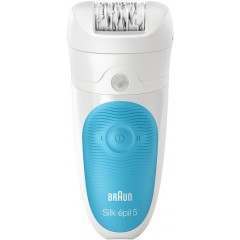 Slim head for ultimate precision - The slim epilator head was designed for absolute precision on the face. 10 micro-openings capture the finest hairs - The micro-openings of the 10 tweezers will catch the finest hairs down to 0.02mm of width, and only 0.5mm of height, so you don’t have to wait for hairs to grow back visibly! 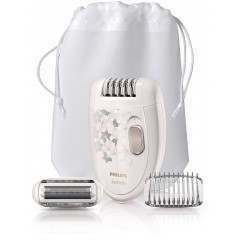 High frequency plucking - At 200 plucking movement per second, the Braun facial epilator can give you a thoroughly smooth skin for up to 4 weeks in seconds. For chin, upper lip, forehead and to maintain eyebrows - From left to right, the two direction switch allows to epilate with ease on both sides of the face. Why epilate on the face? 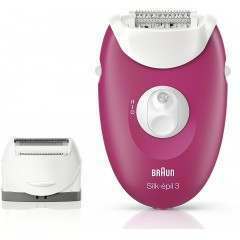 Epilation has many advantages, as it removes even the finest and shortest hairs from the root. It is 200X faster and more thorough than tweezers. It removes 4X shorter hairs than wax so you don’t have to wait for the hair to be completely visible. It is much longer lasting (up to 4 weeks) than depilatory creams. And finally, you can epilate at home or on the go, no need to run to that threading appointment. I’ve never epilated my face before, how should I go about it? Start with the unibrow so you can get used to the epilator head, then move to the upper lip and other more sensitive areas around the mouth and jaw line. Epilate in the evening so that any potential redness will have disappeared in the morning. Yes, due to the small plucking system it’s perfect to remove hairs between and above eyebrows and to maintain eyebrows in shape. It is not recommended to use the device below the eyebrow line. How should I use the brush? 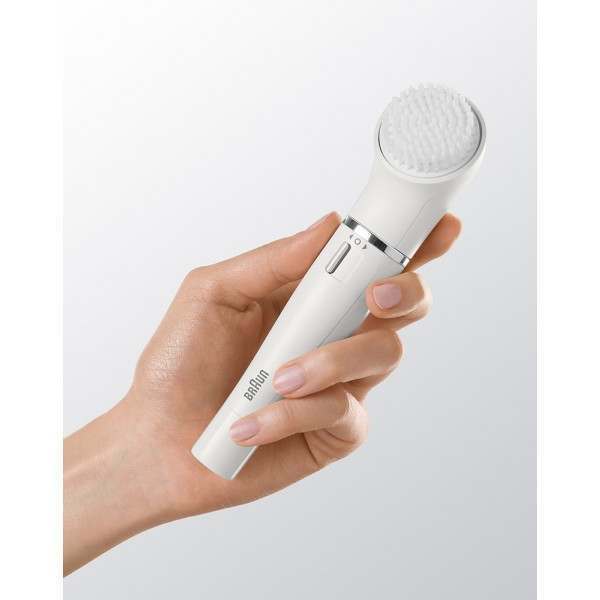 The brush can be used everyday on cheeks, T-zone and chin for a more radiant skin. Apply soap, gel, cleansing milk or scrub on your wet skin. Switch on the brush and start on the forehead. You can move to the nose and then outward towards the cheeks on either side. Spend more time on oily zones. It can also be used on the neck and décolleté. 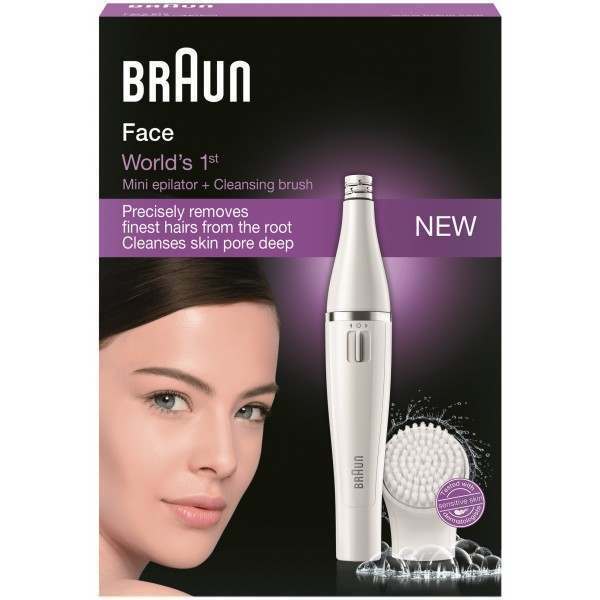 I have skin problems (acne, rosacea, …), can I use Braun Face brush in my daily routine? 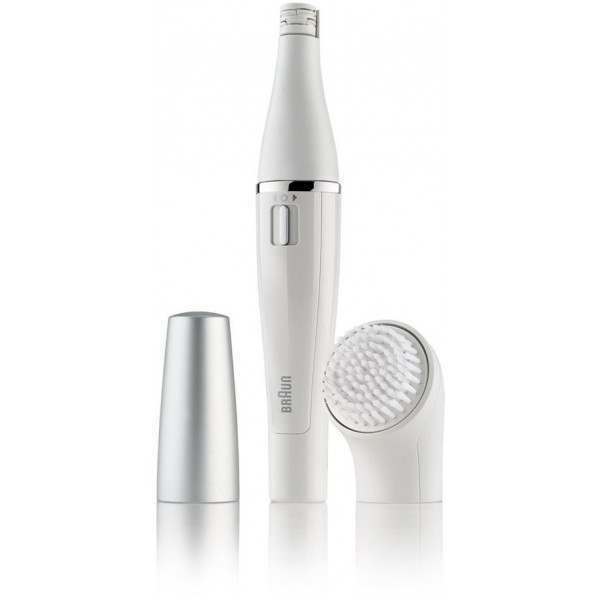 Braun Face brush has been tested by dermatologists and fits most skin types, even sensitive skin. Contact your dermatologist to understand why a gentle oscillating brush is important for skin affected by acne and other conditions. How often should I change my brush? You only need to change the brush refill (Face 80) and it is recommended to change every 3 months max, to maintain top performance and hygiene. Order arrived promptly. Only used once so far and it's a little painful, but sure it will be worth it. 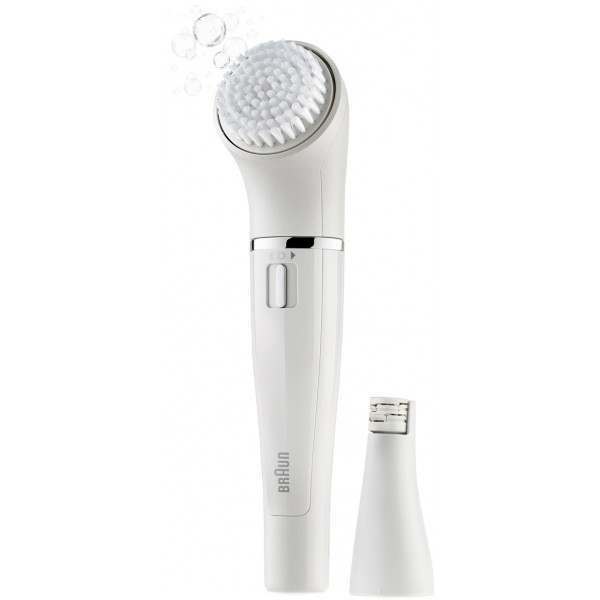 Great little product....only purchased for the cleansing brush haven't used the epilator. Ideal when using in the shower, moisten skin with water then apply your cleaning gel to the brush and off you go. 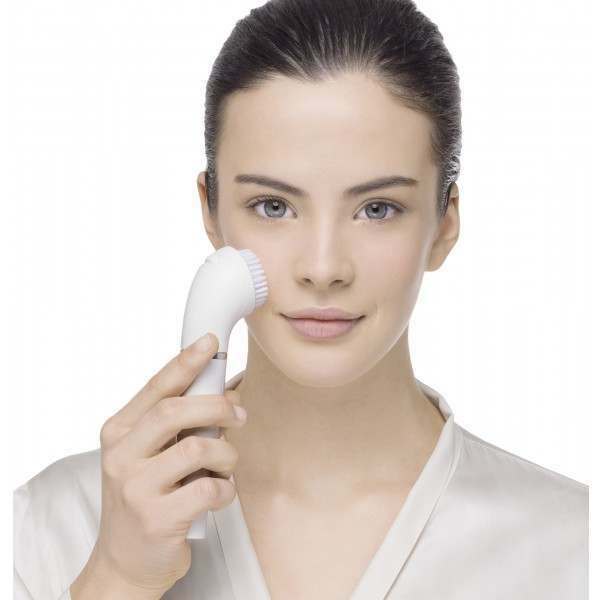 Skin feels thoroughly cleansed and refreshed after use. I use this a couple of times a week and get great results....a great present or gift for yourself.